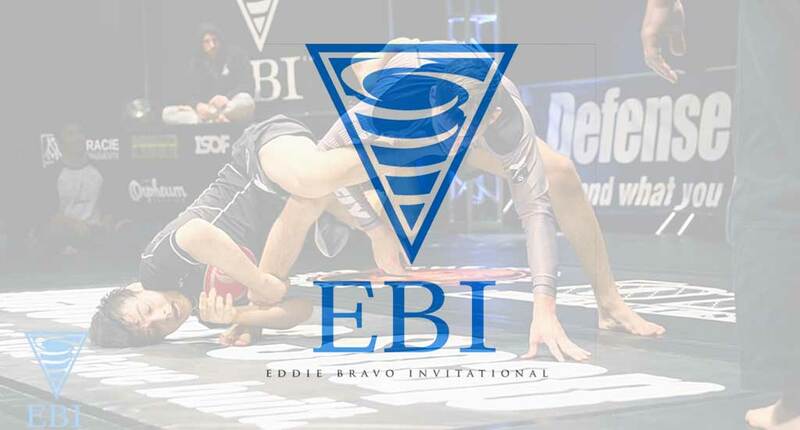 The 13th edition of the Eddie Bravo Invitational (EBI) will take part on October 22, 2017 (Sunday) and this will be one of the most stacked events ever produced by the promotion. 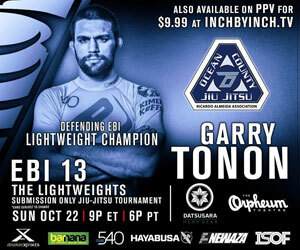 EBI 11 will be crowning the event’s lightweight (155 lbs / 70kg) division champion, a title currently held by Garry Tonon. 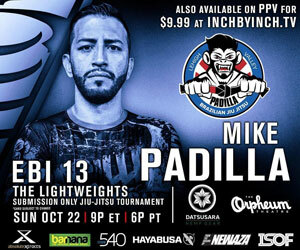 The promotion is bringing forward a mixed bag in talent and experience for the tournament, while also promoting a bonus event under EBI Combat rules, which will be deciding its welterweight champ (170 lbs). Below is a description of the athletes involved on this event. The current ADCC bronze medalist is one of 3 – 2017 ADCC finalists competing on EBI 13’s roster, having he (Rocha) already beaten the other two this year (Agazarm and Tonon). 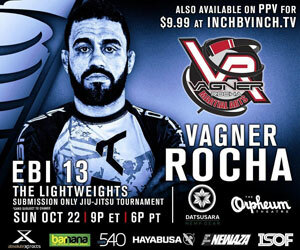 Known for his heated rivalry with Agazarm almost as much as for his grappling success, Vagner will have a chance to continue that animosity at EBI and is seen as one of the favorites to win the tournament. Not known for attacking the feet much, Rocha applies a more ‘old school’ pressure game with good takedowns, excellent top game and a good guard. 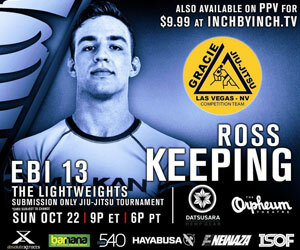 Though still lurking on the outskirts of mainstream BJJ Ross is an avid jiu jitsu competitor waiting for his big shot, and EBI may be it. Keeping won a 3rd place medal at the American Nationals this year but we do not know the full extent of his game. 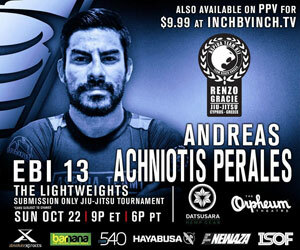 Padilla works at a Renzo Gracie Academy affiliate and has plenty of sub-only experience, having also called out 10th Planet Nathan Orchard for a super-fight under these rules. With Orchard also on the card, Mike may very well have his wish come true. One of Eddie Bravo’s best known students, Orchard brings a very 10P oriented game with a flexible guard and a great killer instinct (particularly from the bottom) as well as a wealth of experience under EBI rules. 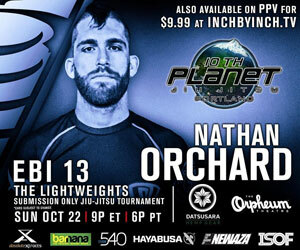 Orchard has competed in the promotion on 3 occasions (2, 4 and 11) and at the Onnit tournament. 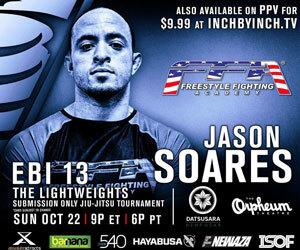 Although we do not have much information about Soares’ grappling achievements, we do know Jason is a David Avellan black belt – he has this much tattooed in big bold letters on his chest, and as such will very likely bring a well rounded game with solid understanding of takedowns, leg-locks, kimura traps as well as a tough top game. Jason is also an undefeated mixed martial arts fighter with a 10-0-0 record, a testament to his talent and toughness, no doubt. 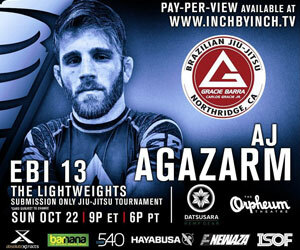 Agazarm had to pull out from the event due to an injury and in his place will be former Renzo Gracie competitor Mike Main, an athlete who competed at EBI on two previous occasions (EBI 4 and 7) as a 65kg challenger. Although unsuccessful in his previous outings, having exited the tournament in his 1st round, Main will make a last minute return with the intent of erasing his previous record and proving his talent is worthy of this level of spotlight. PS. The image displayed is still of AJ. We will wait for EBI to publish Main’s event pics. 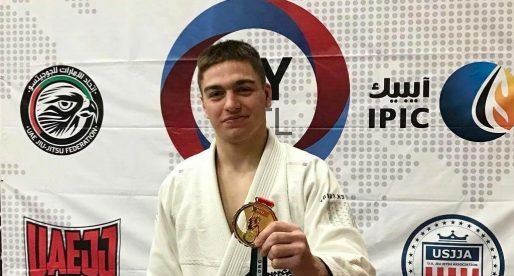 Perales is a black belt not only in BJJ but also in judo, being one of the few regular competitors from the Mediterranean island of Cyprus in this division. 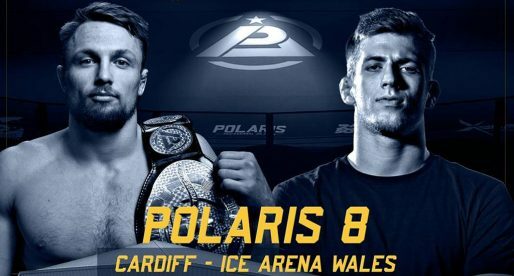 Although not a high-roller in jiu jitsu’s international circuit, he has competed in a few of the bigger European tournaments, including the IBJJF European No-Gi open where he was stopped by AJ Agazarm by 44 points to 0 this year. 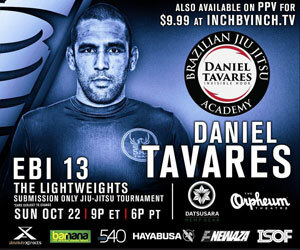 Deriving from one of the most unique lineages in the BJJ world is Daniel Tavares of SAS, a team founded by Grand Master Francisco Sá (RIP). One of the few non-Gracie lineages left in this sport. Tavares has been stationed in the US for some years now and regularly takes part in tournaments in the Masters division. 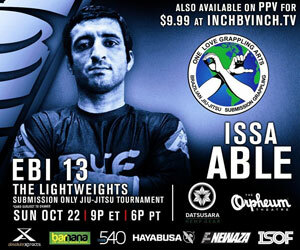 One of the most experienced competitors on the EBI 13 roster is Issa Able, who competes for the Ares academy internationally but will represent his own team OLGA at EBI. A well rounded grappler, Able is very active in IBJJF and sub only rules having a win this year over EBI 11 challenger Sergio Ardilla at the ADCC trials. The Ultimate Fighting Champion (UFC) veteran and former The Ultimate Fighter (TUF) 6 champion returned to competition this year, having been away since 2013. 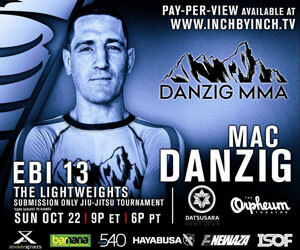 With his grappling credentials often being revered as among the best in mixed martial arts, Danzig will now have a chance to prove his worth in one of the most well distributed grappling shows available. 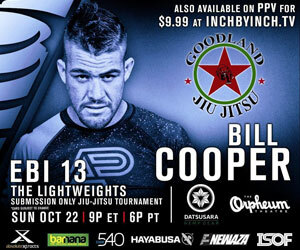 Regarded as one of the very best athletes in BJJ’s middleweight division during 2007-2008, Cooper has since had a few ups-and-downs over the years.Focussed on his return to grappling more than ever, ‘The Grill’ has found success in the sub-only circuit – particularly EBI, being the promotion’s 65 kilogram runner-up in 2016. A member of the 10P Freaks label, Barch comes in riding high on the praise of all in his camp. 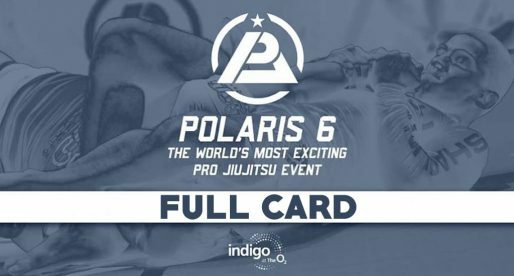 PJ was ranked #4 in the 10th Planet Pound for Pound internal ranking, only topped by Nathan Orchard (#2) and his two instructors – Richie and Geo Martinez. 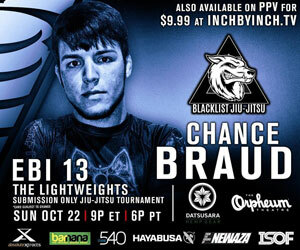 We don’t know too much about 19 YO Chance Braud, who competes mainly in sub-only and NAGA rules. Judging by this young man’s social media (IG: @mmaguy3) Chance a taste for lower limb submissions. 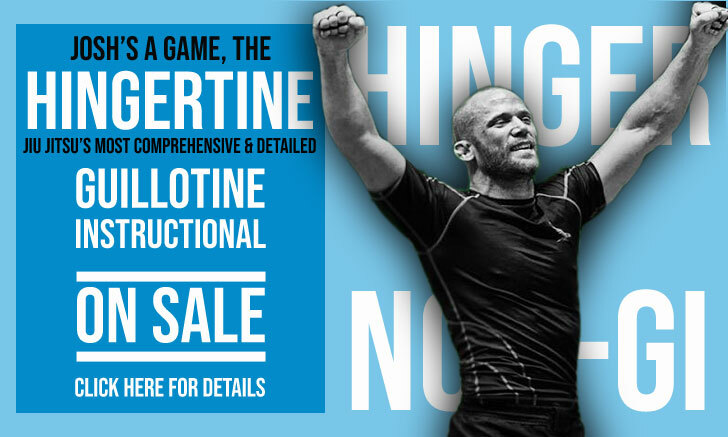 Valente is a product of Vinicius Draculino’s teachings, one of the prime jiu jitsu instructors in the word and a man who produced World Champions such as Romulo Barral, Cristiano Titi, Felipe Pena or Samuel Braga. 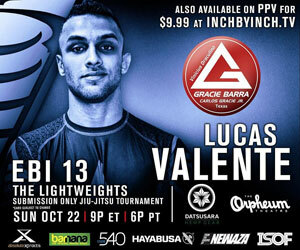 Valente competes regularly with the gi, but will be looking to test himself in sub-only after his success at the Onnit Invitational. 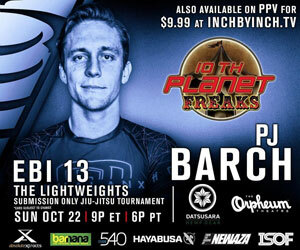 EBI’s lightweight champion returns to defend his belt, a title he has conquered 4 times in 3 different weight classes. Tonon will start the race in the pole position, having the strap and the perfect style for this setting. The Danaher Death Squad member should have in Vagner Rocha his toughest challenge. IBJJF London Fall Open, Jackson Sousa’s Tripple Gold in Historic Day for the Irish!